Glass by Jen Wen Luoh (Montreal, Canada) - 2010 | Flickr - Photo Sharing! 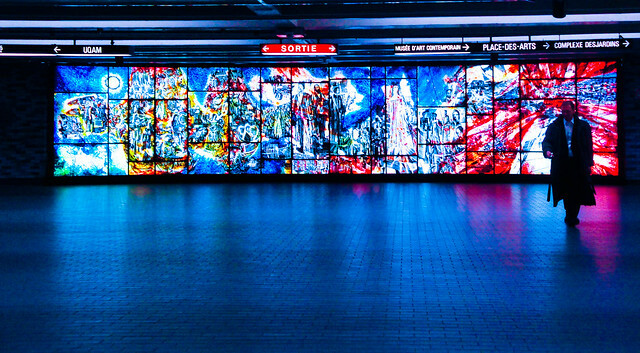 The stained glass window by Place-Des-Arts metro. The guy matched the blue given off by the glass. This is very nice! The composition is great with the guy on the right. I love this metro exit. I love this metro exit too. Nice! I hope you have a chance to snap some pics of Moose's and bears! Thanks Andrew! When will you be coming to Montreal? Pedro: that'd be great except that I was on a cruise the whole time so the only wildlife I saw was seniors. I got some good glacier shots! But no time to fix it yet.